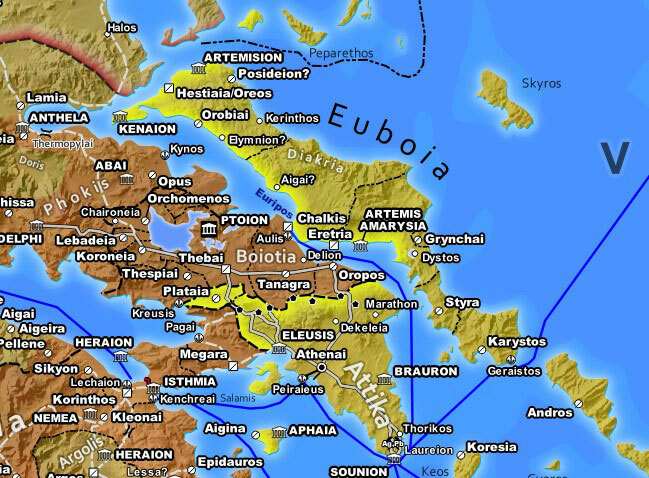 Currently I am making great progress in finishing another old project, a highly detailed map of Classical Greece. The full Bronze Age map is currently on hold, to finish another old project first. As you may know I was never completely satisfied with my DIN A0 map Dawn Classical World 500 BC. It was my second big mapping project, which I begun immediately after successfully finishing my Roman Empire map. The goals were very ambitious, a single map depicting the entire Persian Empire and Western Europe in similar detail. At the same time Sardis Verlag urgently needed a second map to supplement Imperium Romanum 211 AD, thus the available time was limited. I think the result suffered from both points. Due to the small scale some regions like Italy and Greece already look very crowded, while I still couldn’t include all the details I wanted to show. Comparatively large parts of the map are almost empty, partially due to the arid nature of these lands, but also due to a lack of readily available data. Thus, I greatly underestimated the required time for research. Consequently, the map looks somewhat unbalanced, unpolished. Originally, I had plans to include a second larger scale ancillary map to show Greece in greater detail, similar to Etruria and Latium Vetus. However the space for anything meaningful above the 1:5. Mio scale Greece on the main map simply wasn’t there, the area filled with the Latium map too small for the entire Aegean in a significantly larger scale. This proposed ancillary map instead evolved into a postcard published by Sardis Verlag roughly half a year before the main map. Already back then I had plans to develop it into another highly detailed wall map and that’s what kept me occupied during the last few months. The new map of Classical Greece is done in a 1:1.5 Mio. scale and should at least include all territories affected by the Peloponnesian War. The political borders will be representative for the years preceding the war, but the map will also include (marked) 4th century foundations, to cover all of classical Greek history. So far there are already more than 550 cities, harbors, sanctuaries or forts on the map, accompanied by over 120 other labels, such as the names of mountains, islands or regions. Additionally I am adding new rivers, islands and lakes to my data sets, appropriate for the larger scale. I’ve not yet decided what the final size of the new map will be. DIN A0, B1 or A1 are possibilities (see image below). The bigger formats would allow me to include larger parts of Italy, up to Roma, and even some additional Carthaginian territories relevant during the Greco-Punic Wars between Carthage and the Greeks of Sicily (as ancillary map). The final decision also depends on any future plans for Dawn Classical World. The three possible sizes for my new map "Classical Greece"
After the Classical Greece map is finished there will be some smaller things to do, like the next version of Roman Era Hesse. Then, I will either finish the Bronze Age wall map or make a second version of Dawn of The Classical World. For this task I have essentially two options. Either refine the map as it is now, it has already greatly benefited from the additional research done for the Classical Greece map, or a more substantial rework. My current ideas for this are to shift the main map to the west and change the projection. Instead of the two inlay maps of coastal Spain I would include a single ancillary map for the entire Persian Empire in a smaller scale.